I took this first blossom of one of the volunteer sunflowers beside Randolf Avenue here in Clarksville on June 13, 2017 with Cell Phone Boy's camera. 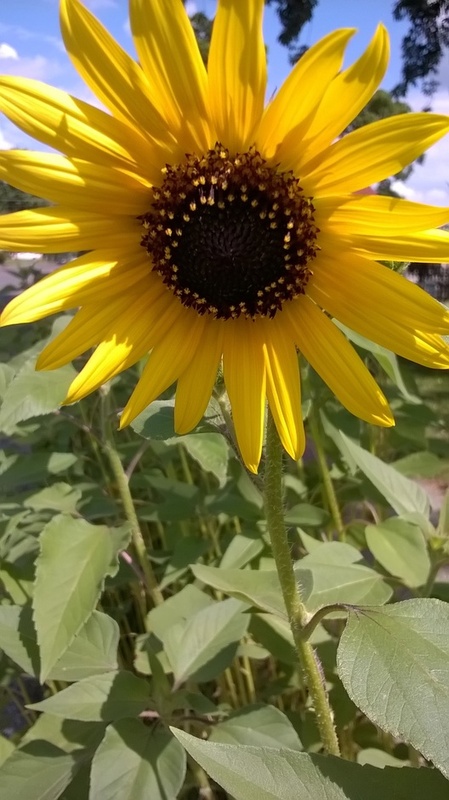 Hammerhead and I had first seen these sunflowers last summer in 2016 growing beside the road near the stop sign in a grassy area next to the sidewalk. We watched them as we passed by that route on our way to Wendy's all last year, seeing their progress from flowers to seed. I tried to get some seed from them last year to get a start, but the birds probably got most of the seed. Enough of the seed fell back to the ground that the sunflowers reseeded this year, enabling the original "Sunflower Girls'" daughters to come up this year. Hammerhead and I continued to watch their progress again this year, hoping no one would destroy them. One day as we were passing by we saw the lady, who has the house next to where the sunflowers are, carefully mowing around them. Her yard is a certified wildlife refuge, certified by National Wildlife, I think, according to the little plaques she has on her fence, and her yard is filled with beautiful flowers of all kinds. Hammerhead and I stopped at her house once for a yard sale a year or two ago. Hammerhead got to see the sunflowers for two years, and always enjoyed looking at them. He passed away on August 3, 2017 Thursday morning. I will have more about that in the diary entry this month, as well as photos of him, and will eventually make a memorial page for him on the website. Now the sunflowers are going to seed, although a few flowers are still blooming. And Hammerhead has gone on to reap the rewards of his righteous life, after 90 1/2 years, in his new Heavenly Home. And his sunflowers, hopefully, will reseed, for the original flowers' "granddaughters" to bloom next summer. I took this photograph of some of the pink plants I had growing on my porch last summer. The crow and sunflower plant stake is from the Dollar Tree. The plants were from Al's Fruit Market. I especially like pink plants and always try to grow a pot of them on my porch each summer, although I did not get any plants this year, and the seeds I planted did not come up. I may try to start some later if I get time, although I will probably do well just to take care of what I've already got planted this year! I will definitely try to get some next year, though. I have a few large buckets of cherry tomatoes and flowers on my porch each year. The pink plants can be brought inside for the winter as house plants and then set back outside in the spring, although I do not really have any place with enough light for house plants to do well. So it might be better just to wait until next spring to get more pink plants. Gain, my husband, had a huge pink plant on the coffee table in our living room. It got plenty of light from the east facing picture window and did well. He had it when we were first married, and it lived for a number of years on the coffee table--I never set it outside, not knowing then that you could do that. I also did not know that you could start new plants with cuttings, just by cutting off a few shoots when the plant was big enough to spare them, and either starting them directly in pots or putting them in glasses of water until they rooted before planting them. When I found that out, I started many more pink plants! We were living in Kokomo by then and I had a big front porch to set all my plants on. 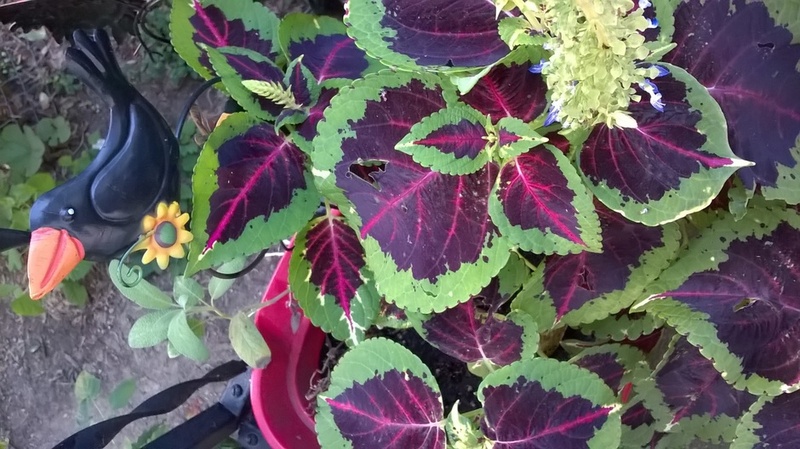 Gain and I called them "pink plants" because we did not know the proper name for them, which I later found out is coleus. There are many shades, most of them pink, but also red, and shades of yellow, most with variegated leaves in several shades, or some solid colors. Some plants have notched or ruffled leaves. They are all pretty, but I like the ones with the regular leaves that are a bright pink with green outline because that is the kind Gain and I originally had. The one in this photograph has a bit darker leaves than my favorite kind, but that is all Al's Fruit Market had left when I bought this one. All of their flowers, and especially the pink plants go fast every spring! Al's Fruit Market, actually correctly called, Al's Farm Market, does not have a website. I just checked to make sure. However, if you live close by it is a good place to shop. They are only open during the warm weather. Opening and closing time each year depends on the weather because they only have a small unheated building that can be closed up completely in the winter. When they are open, the panels on the building are open so that the main building is mostly open to the outdoors. The owners grow much of the produce on their farm and hire the same people every year to work in the store. In the spring the entire parking lot is filled with their beautiful flowers of all kinds and also vegetable plants for sale. They are very busy then. In the summer they also have their regular customers, like me, who come back for their fresh quality produce. While they are open, I never buy fruit or vegetables from the supermarket. They also have a section with locally made jellies, jams, honey, and salad dressings. Their jellies and jams are made with sugar, not corn syrup. I was shocked to find out, when I checked ingredients on the jars of jelly and jam at Kroger's one day, that most of the national brands of jelly sold in the supermarkets are now using syrup in addition to or instead of sugar, even the expensive brands! Al's Fruit Market only has jellies and jams made the old-fashioned way with sugar! They aren't quite homemade, but the small company that makes them is not far from here. Al's Fruit Market keeps a mailing list that you can sign up on at the store, and each year they send out cards to the mailing list letting them know they are open for the year. They also put big signs by their building letting everybody know that they will be opening soon or that they are closed for the winter. The Dollar Tree is my favorite place to shop, right after yard sales, thrift shops, and the flea markets! Everything there is a dollar, hence the name. A few of their canned goods and candy bars, etc. are less than a dollar, but all of their other merchandise is only a dollar. Nothing is over a dollar. So this store is the closest store left nowadays to an old-fashioned "Five And Dime" store, allowing for inflation, of course! They have a little of everything, food, holiday decorations, kitchen and housewares, toys, books (remaindered bestsellers, now only $1.00), and get in new merchandise every week. The store here in Clarksville is especially big on holiday merchandise, getting in new merchandise each week, right up to the last week before the holiday. They are really big on Halloween here, and start getting in Halloween in August. They just have a little Halloween out now, but started 2 weeks ago! By September, Halloween, mine and my brother's favorite holiday, will be in full swing at the Dollar Tree! All of the Dollar Tree people here in Clarksville know Hammerhead and me, and the Dollar Tree was one of Hammerhead's favorite stores. It is a small store, and the people always took time to visit with him, and some of them even came to his visitation at the funeral home. Friday was Dollar Tree day for Hammerhead and me. The store people told me once that the truck came in on Fridays, and that by Saturday usually everything was put on the shelves. They always have plenty to choose from, though, so you can go any day. I will probably go on Thursdays now, as that is my big shopping day for the week. I only took Hammerhead on Friday because Thursday was Kroger shopping day, and it got too much for him to do both in one day. Saturday was yard sale day, and also Saturday was too busy for him to shop in the Dollar Tree because of the long lines. Check out the Dollar Tree's main website. They have many stores and you can also order online and sign up for e-mails and an account. They have lots on their website, including videos and craft ideas. One year they had a neat Halloween haunted house game I played. Probably they have it every year, but I never got back to check. I will try to get time to check again this year. I know the game was on the website before for a couple months up to Halloween and it was fun to play. 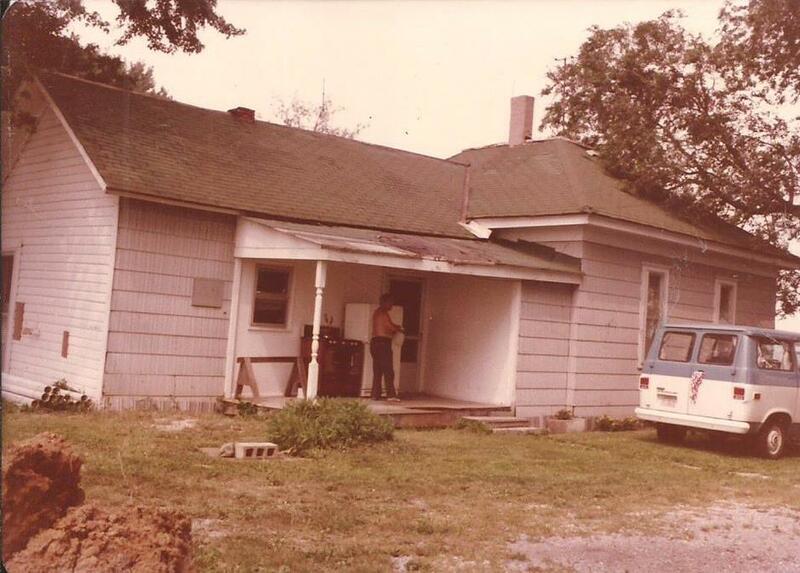 This photograph of the old house was taken by Mama on one of hers and Daddy's visits to us. I am standing on the small back porch that faces toward the west. Our property, as with the rest of the properties in the small town of Wheeling, Indiana, was carved out of a long ago farm. All of the properties along Highway 29, which are only a few that make up the tiny town, are an acre and a half. Our property, like the rest of the properties, stretched back to the cornfield to the west. The cornfield stretched to the horizon, appearing to stretch to infinity. Across the road was another cornfield that seemed also to stretch east to infinity. There was another porch on the other side of the old house, but the one where I am standing opens into the living room of the old house. As the photograph shows, there were two doors opening from the living room onto the west facing porch. Another door in the living room also opened onto a small covered entrance way on the north side of the house. The wild phlox in the backyard is in bloom in the photograph. I also found this photograph in one of Mama's old books of photographs of the old house and their trips up to visit Gain and me. 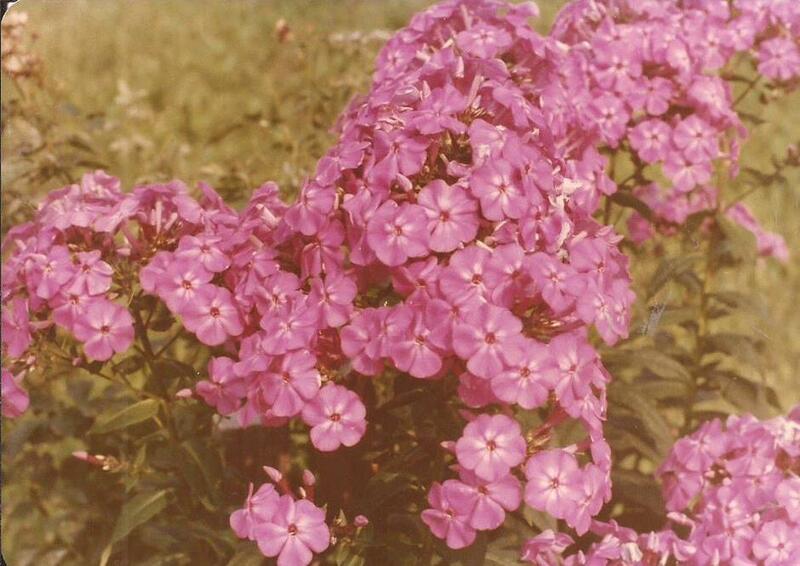 She has the photograph merely labeled as "Mary's Flowers", but it is a close up the wild pink phlox in the photograph above this one. I know it is wild phlox, even though she didn't label it as phlox because I now have the same kind of phlox flowers, both pink and white, more every year as they reseed, in her yard here at her house now. She must have originally planted it here, because I did not plant it, but because it reseeds, I am sure that there is much more than she originally planted. It has even spread outside the yard now, and she would never have planted anything outside the yard because she wouldn't have had control over anything not on hers and Daddy's property. I let it grow where it will and perhaps people passing by walking might also enjoy seeing it. It was April, Easter weekend, but it didn’t feel like spring in Carrollton Location, not the soft, gentle spring Curt had known in Paradise County so long ago. This was a cold, raw, uncertain spring, typical of central Indiana. As always the wind was blowing, not hard like it does a lot of the time, but still he always knew it was there. Curt was still glad to be outdoors again, ready to do some physical labor, to get started preparing their new home for him and Mariette to move into. It had been a long, mostly inactive winter. So Curt had arranged with Roy and Nettie Hensley to meet him and Mariette at Carrollton Location on this Saturday in early April. Curt had hoped that it would be warmer, but the time was already set up with Mariette’s folks. 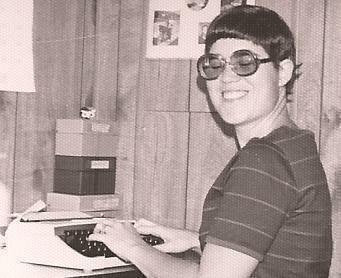 Besides, Saturday was the only full day Curt had to work on his own projects. And he was impatient. Once he made up his mind to start a project, he wanted to get it done. Crossroads is a small town at the junction of state highways 29 and 22 about 7 miles south of Carrollton Location. Meaghn Louise was with them this weekend too. She loved going over to the Carrollton Location property. A city child, she thought it was enormous and was sure her Dad must be rich to own so much land. Nettie had her camera with her, of course. She also had the ghostly photograph in her purse. On this bright April day her fears about the old house seemed rather ridiculous now. She was still determined to get a few minutes alone sometime today to look over the site of the photograph, though. There was probably a logical explanation for the whole thing. As Roy believed, it was probably just something she’d done wrong on the lighting when she’d snapped the photo. As Nettie got out of the car in front of the old house, she couldn’t help thinking that the old house looked pitiful, not fearsome. She hoped Curt and Mariette would be able to fix it up. They would love the house she knew, and it had obviously been a long time since anyone had loved it. Curt was thinking the same thing, but in his more practical, masculine way. He, Mariette, and Meaghn Louise had arrived shortly before Roy and Nettie. Curt was using this time to walk around the house, looking at its foundation more closely, if the bricks propped under the house could rightly be called a foundation. In the cruel clarity of the April morning, all of the old house’s deficiencies were more clearly visible, but especially the cobbled up “foundation.” Instead of pouring a proper concrete foundation, the long ago builders had merely stacked several layers of bricks and then built the house on top of this. Curt shook his head in disapproval. Their sloppiness had been the ruin of a house that should have stood solidly for many more years. The whole house had shifted because of this. It wasn’t immediately obvious, except to an experienced carpenter like himself. All the casual observer would see was the missing bricks here and there. Curt had an eye for straight lines, though, and nothing about this house was straight anymore. “The foundation has settled.” Roy had joined Curt now. “Yes. I don’t think the house can be saved,” Curt told Roy. Roy examined the foundation. The two men were at the side of the house now, near the house’s main entrance. Roy bent down to look at the bricks holding the old house up. He removed one of the loose bricks and peered underneath the house. The earth underneath the old house smelled sour and old. The air underneath the house seemed colder and darker than it should be. Roy had a sudden crawling feeling on the back of his neck, the kind of feeling that comes when you know you’re being watched. He dropped the brick and hastily stood up. Curt began showing Roy how the wood around the windows was rotted and would involve major repairs. “I wonder if it might not be better just to tear it down and set up a mobile home,” Curt wondered. Curt and Roy continued discussing the pros and cons of this course of action until Nettie, Mariette, and Meaghn Louise joined them. Mariette felt as if she herself was being threatened with destruction. She couldn’t tell Curt that. He wouldn’t understand. Once again the certainty that the old house’s past was their future came to her, stronger than ever. Somehow she must convince Curt not to destroy that future. Mariette felt as if she had had a reprieve from destruction. She knew now that she must learn the old house’s secret as soon as possible, before it was too late. She had no idea how to go about learning its secret, though, or even what that secret might be. No more was said about the fate of the old house that day. Curt and Roy began tearing the old garage down while the women stacked the boards on the dirt floor for burning. Mariette had been running an idea through her mind as they stacked the boards. Now she spoke. “ All right!” Meaghn Louise was in total agreement. Everybody else was in favor of the idea too. “I don’t care. Whatever you guys want to do.” Curt was agreeable. The two men elected to stay behind and do a little more work. Meaghn Louise decided to stay too. “Hurry back,” Curt told Mariette. “I will.” She kissed him before driving away in the pick-up truck with her mother. The Crossroads Supermarket was a small, but well stocked little grocery store. Mariette had never been in it before, and she was eager to check it out. She would probably be doing most of her grocery shopping here once they moved to Carrollton Location. Mariette liked to shop for groceries. She liked to shop for anything. She shopped every two weeks for the main part of her groceries, laying in supplies of things when they were on sale and using coupons, as her mother had taught her. On the off week, she went to the store only for bread, milk, perishables, and odds and ends. She shopped slowly and methodically from a list on her big grocery week, adding up her purchases as she went along, spending a predetermined amount, and writing a check for the total. She did the same on the weeks she only bought a few items, but usually paid cash on those weeks. Mariette filled her cart with the necessities first, buying luxuries only if there was money left to do so. Usually there was money left for a number of luxuries, due mainly to Mariette’s planning. After she finished shopping, before checking out, she liked to look at the magazines. Usually she bought a few out of the money she saved by her carefully planned purchases, women’s magazines with recipes and crafts in them. Curt hated to shop for groceries, and Mariette never asked him to except occasionally in the winter when bad weather kept her from driving. She preferred to go alone anyway, as that was her big weekly outing, and Curt just wanted to rush through the grocery store. Mariette and her mother stopped to examine the contents of the shopping cart at the front of the store. It was filled with bent cans and discontinued items at discounted prices. “Those boxes of Cracklin’ Oat Bran for 5 cents are a good buy,” Mariette decided. She and her mother both added several of the single serving boxes of the cereal to the shopping cart they were sharing. Mariette added hot dogs, marshmallows, buns, mustard, catsup, and pop to the cart, quickly scanning the lay out of the store as she shopped. She didn’t want to stay too long because she’d promised to hurry back. She and her mother snatched a few moments to look at the magazines, though. For such a small supermarket, the Crossroads Supermarket had quite a large selection of magazines and paperback books, Mariette noted with satisfaction. Nettie bought several Tower Press craft and doll collectors magazines. Tower Press was a small publishing company that published several different women’s magazines, mostly crafts and recipes, but most of the pages were devoted to letters from housewives, wanting other housewife pen pals to write to and exchange patterns and recipes. The small magazines were hard to find in most stores, so Nettie snatched them up eagerly. As they paid at check-out, the bag boy added a small magazine called Family Happiness to each of their sacks. “Compliments of the store,” the checkout girl explained. “It’s published every week and free. Only IGA stores have it. There are articles and recipes in it.” The Crossroad’s Supermarket’s name was imprinted on the cover. The bag boy carried their groceries out and put them in the pick-up truck for them and pushed the cart back to the store. “That was fun,” Mariette said as they left the store. She felt happy to be doing something with her mother. Mariette and her mother had always been close. “It was, wasn’t it?” Nettie smiled. Meaghn Louise had had a secret reason for wanting to stay behind while Mariette and Grandma Hensley went to Crossroads. Usually Meaghn Louise was ready for any chance to go anywhere. Today, though, she wanted to explore the old house all by herself. The old house both fascinated and scared her. It seemed so enormous and so old. Meaghn Louise and her mother lived in a small apartment. When her father and mother had been married, they’d had a house, but nothing like the spooky old place that Dad and Mariette had now. Dad and Grandpa Hensley were still tearing the garage down, but Dad had said that they weren’t to stack anymore wood for the fire yet. Meaghn Louise waited a few moments. They weren’t paying any attention to her, so she slipped away. As she approached the old house, her courage faltered. She had never been in the old house alone before. It was kind of neat in a spooky way when she was with Mariette, but suddenly it seemed more spooky than neat. Meaghn Louise didn’t want to be a baby, though. Only babies believed in ghosts. She wasn’t a baby. She was 8 and a half. The door squeaked as Meaghn Louise opened it and she almost ran away. As she turned the big white ceramic door knob, she could see the white paint peeling off the weathered gray wood of the door. Afterwards, the image of that door would be forever burned into her mind. Even after she grew up, she would occasionally see that door in her nightmares. The bright April sun was suddenly extinguished as Meaghn Louise entered the old house. Inside of its ancient rooms there was a perpetual twilight. Meaghn Louise hesitated just inside the door. “Baby! Afraid of the dark!” her mind taunted her. She took a deep breath and stepped into the hallway, leaving the door open for a quick exit if it became necessary. She stopped to explore the room Mariette had told her she could have for her own. She looked out the window and saw her father and Grandpa Hensley still working, removing boards from the roof of the old garage now. She began to feel slightly foolish about her fears. Feeling much braver, she ventured deeper into the interior of the old house. Meaghn Louise stopped to look at all the rooms in the back part of the house. The musty smell was stronger further back away from the door. Meaghn Louise wrinkled her nose in distaste. She was sure the windows hadn’t been opened in years. She paused to chip a flake of white paint off a windowsill in the master bedroom. Somebody had painted the walls mulberry. On one of the walls they had painted an electric green motorcycle. “Probably some dumb boy!” Meaghn Louise decided. She looked in fascination at the place where Dad had chipped the paint off the wall, exposing layer after layer of previous coats of paint. The weight of all those years began to oppress Meaghn Louise. She was too young to realize that she was feeling the weight of her own mortality. All she knew was that the scary feeling was coming back. It was very quiet in the old house. She couldn’t hear Dad or Grandpa working outside anymore. Meaghn Louise ran back through the hall as fast as she could. The hall suddenly seemed endless and the walls seemed to be getting closer and closer on either side of her. After what seemed forever, Meaghn Louise burst into the dining room. She started to run outside. The small insidious voice in the back of her mind whispered, “Baby!”, though. She wheeled around and went into the kitchen. If she went into every room, then it would count. Then she could go back outside. She hurried into the walk-in pantry. It was the last room and then she would be free to get out of here. It was darker in the pantry than anywhere else. It was almost dark enough to need a flashlight, but Meaghn Louise didn’t have a flashlight. She suddenly realized it was abnormally cold in the old house. She began to shiver in spite of the pink quilted coat she was wearing. The feeling of fear escalated to cold terror. Meaghn Louise felt a crawling sensation of evil as she stood over the place where Simon LaGrange had buried his money over thirty years ago. She had her back to the door and the feeling of something watching her from the doorway became too strong to resist. Slowly she forced herself to turn around. Meaghn Louise screamed. She thought her heart would stop. In the doorway was standing a white shape. It looked like the bent over figure of an old man. At that moment the front door slammed, making Meaghn Louise jump. At that moment also the ghostly white figure dissolved like fog in sunlight. Meaghn Louise wasted no time getting out of the old house. Outside the sun was still shining brightly. 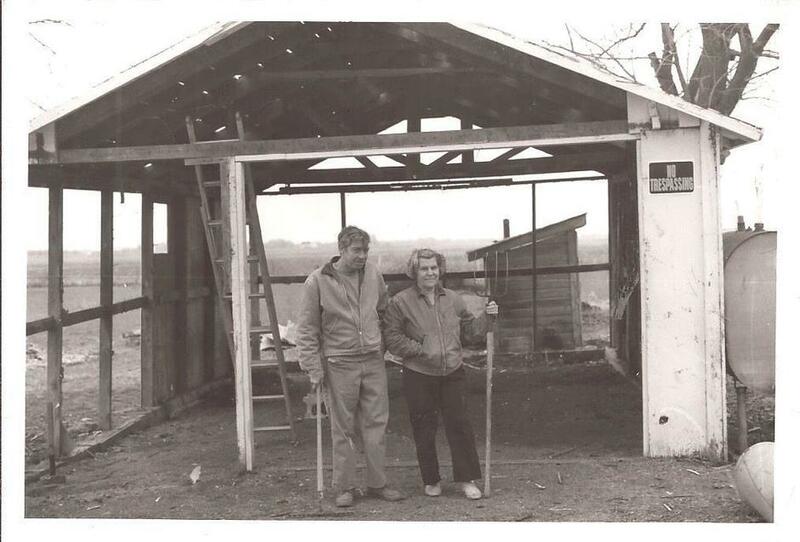 Dad and Grandpa Hensley were still tearing down the old garage. Everything looked normal. As she stood in front of the old house, wondering if she’d imagined the ghostly figure, Mariette’s pick-up truck turned into the drive. It had turned much colder now, and in spite of the sun, the wind had a raw edge to it. Inside the shell of the old garage, though, the bonfire’s bright orange flames crackled merrily. Curt and Roy had started the fire from boards taken from the garage. Now everyone was waiting for the fire to burn down low enough to begin roasting the hot dogs. “Few people burn their garages down so they can have a wiener roast,” Mariette giggled. “I thought that was the way it was always done,” Curt replied in a deadpan voice. By the time Mariette, Meaghn Louise, and Nettie had unpacked the buns and other food, the fire was burned down enough to roast the wieners. “Want me to toast yours?” Curt asked Mariette. The fire felt good now. Mariette stared in its red heart as she toasted her wiener. One of the boards from the garage was nearly burnt to gray ashes now and Mariette brushed her stick against it. A few of the gray ashes clung to her wiener when she popped it into the bun. Even under all the mustard, she could taste the bitter sweet taste of those ashes. The garage is made of the same boards as the old house, she thought. That is how the old house tastes too—bitter and sweet at the same time, and as old as time. She shivered violently. After the picnic, Curt and Roy continued tearing down the garage. It only took a little of the women’s time to keep the fire fed with the boards the men removed. Once the fire was going good, Nettie slipped away. It was now or never, she thought, as she started toward the old house with the ghostly photograph in her pocket. 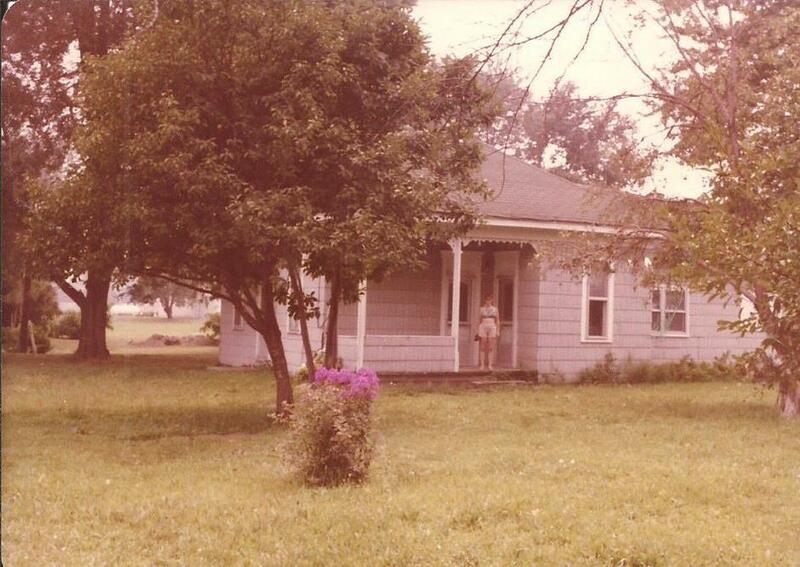 Nettie stood on the front porch of the old house, her hand on the door knob, for what seemed a long time. She was oddly reluctant to go in, afraid of what she might find. This is ridiculous, she told herself. This is going to be Mariette’s and Curt’s home. I’ll be visiting them here often. I’d better not start imagining ghosts now. She looked around. Meaghn Louise was nowhere to be seen. She’d probably wandered off to explore. Mariette was feeding a board to the fire, her back to the house. Curt and Roy were busy with their work. No one seemed to have even missed her, so she couldn’t have been standing on the porch, frozen in the act of entering the old house, but for just a few moments. Someone would have noticed and thought it odd. Still it seemed like a long time. Nettie had a dim feeling, that she couldn’t quite put into words, that the old house somehow took time and twisted it into curious shapes that had no relationship to the hours and the minutes of the clock or the pages of the calendar. Taking a deep breath, Nettie entered the old house, leaving the door open behind her. Everything was the same as she remembered it inside. Cold gray light filled the empty dining room, and the silence seemed as thick as the dust that laid over everything. Nettie walked through the dining room to the kitchen. Everything was the same as she remembered it in the kitchen. The old beat up green table someone had left, and that Mariette had fried hamburgers on, the day Nettie had taken the photograph was still there. Nettie looked at the photograph again, trying to find an excuse not to enter the darkness of the walk-in pantry. The ghost, or whatever it was in the photograph, looked more like a hunched over figure than before. There was no way it could be mistaken for a flaw in the photograph. Once again, Nettie wondered why Roy had been unable to see it. The feeling of evil emanating from the figure of the hunched over old man was stronger than ever. Once again, Nettie felt that only Mariette was in danger from the ghost, or whatever it was. Still the feeling of sick terror filled her, and it was all she could do to make herself enter the walk-in pantry. She half expected the figure of the old man to materialize as she walked through the door and to grab her, but the pantry was as empty as the rest of the house. Nettie walked in the pantry, trying to decide where the feeling of evil was coming from. She knew it was coming from the pantry more strongly than any other part of the house, but there was one place in the pantry where she could feel the evil more strongly than anywhere else. It was where Simon had buried his money. Although it was some time until sundown, shadows were already gathering in the old house. Or were they creeping out of the pantry and filling the rest of the house? It was practically dark enough to need a flashlight in the pantry. Nettie continued standing over the place where Simon had buried his money, trying to figure out what was causing the feeling of evil that seemed to pervade the old house. Nettie had never had any psychic powers that she knew about, or any desire to know about these things. But ever since she had seen the house that Curt and Mariette had bought, she had had the feeling that there was something wrong with it. That was the only word she could think of to describe her feelings about the house, and she wasn’t sure what she meant exactly. Only that the feeling that her daughter was in terrible danger here persisted. The feeling had become stronger since she’d taken the ghostly photograph. Nettie tried to think, hoping somehow to get psychic vibrations, she supposed the term was, as to the nature of that danger. The sound of the door slamming and footsteps in the house nearly caused Nettie to scream out loud. Nettie’s relief that the intruder was human, not ghostly, made her feel suddenly dishrag limp. She held onto one of the shelves in the pantry for support. She knew she was being foolish, but she couldn’t help it. She wished Mariette hadn’t come in. The old house wanted Mariette. Yes, that was the feeling she had been searching for words to express. It wanted Mariette. Something about Mariette was necessary to the old house’s continued existence. It wanted to feed on her psychic energies just as a wolf fed on a rabbit. “Mama. I’ve been looking all over for you. Have you been looking at the pantry? Isn’t it neat? Have you got any ideas about redecorating it? I thought I might cover the shelves with old barn board design contact paper, you know, the gray kind that looks old and…” Mariette broke off what she was saying when she saw the photograph Nettie had left lying on the kitchen table. “Oh, Daddy got the photographs developed that you took last time we were here? This one turned out good…” Mariette broke off again. Nettie hurried over to her daughter and took the photo out of her hand. She hadn’t wanted Mariette to see that photo. Mariette wasn’t fooling her mother. With a mother’s sure instinct and her new found psychic powers, Nettie was certain that Mariette saw the figure of the hunch back man. Nettie never liked to discuss unpleasant things, though, feeling on some subconscious level that whatever was ignored would go away. Or if not go away, at least not be as bad. If Nettie had her way, Mariette would never have a copy of that photo. She suddenly had the absurd idea that if Mariette had a copy of it, the hunched man would gain some kind of supernatural power over her daughter. She didn’t want to destroy the original or the negative, though, because she felt it held the key to the evil of the old house. If only she could study it long enough, perhaps its meaning would become clear. Nettie and Mariette left the old house together. It was much lighter outside, but the April day had lost its brightness and the Carrollton Location wind was sweeping in over the empty field. Curt and Roy were beginning to put their tools away. They had already made sure the fire was out. “Guess we’d better call it a day,” Curt said. On the way home, Mariette continued to think about the photograph that her mother had so quickly hidden from her. It looked as if there was a ghostly figure in the photograph, although Nettie hadn’t given her a chance to get a really good look at the photograph. Mariette was excited. Could it be possible that she and Curt were the owners of a real haunted house? Could Nettie have photographed a ghost? Her mother had looked scared when Mariette had entered the house.Mariette was more sure than ever now that her mother knew much more than she was willing to say. Mariette determined to get to the bottom of it all eventually. Suppose there was buried treasure in the old house and the ghost was trying to lead them to it? Mariette fell asleep that night thinking of the possibility of them becoming fabulously rich when the ghost revealed its hoard of gold coins to her. She dreamed about being lost in the Nightmare City Without A Name, though. In her own bed, at home in Libertyville that night, miles from her daughter, Nettie too walked the streets of that cursed city. Mama took this photograph of Gain, and it was in the same book with the other photographs she took at that time during that visit to us. We probably hadn't moved to the property then, as the photograph shows the place dug up where we were putting in a water line. The van in the photograph belongs to Mama and Daddy. They called their van Blueie, and used it for transportation and also camping, but when they visited us, they always camped in the old house if it was warm enough. Mama loved the old house as much as I did. This photograph shows the south facing porch at the main entrance of the old house. The rest of the photographs I'm using to illustrate this chapter of Mariette's book are of the Easter weekend in 1979 when we did indeed tear the old garage, which was only a shell, down and burned the boards to have our wiener roast picnic in the garage. These are only a few of the photographs of that day that I found in Mama's book. I will publish more of them later, and also will have to save most of the rest of the picnic and flower photos I had intended to publish this month for another day. I want to publish a tribute to Hammerhead in this month's diary post, as well as some photographs of him and of the wild Maypops I found in my yard, and that he wanted to see, but never got to see. So I need to save room for that section. I am not sure how much space I have left for this post. The Crossroads Supermarket in the fictional town of Crossroads where Mariette and her mother shop for picnic food in this chapter is also real, as is the shopping trip. The Crossroads Supermarket is actually the IGA store in Burlington, Indiana, where I always got my groceries. When I first started shopping there Larry Waddell owned the store. He later retired and moved to Sanibel Island in Florida, but before he moved he stayed and worked in the store for a year showing the new owner that he had sold the store to how to run it and what to do. The new owner was Greg, but I never knew his last name, so don't know if he still owns the store now. I was able to web up the main IGA website and also the website for Walker's IGA in Burlington. After Greg bought the store from Larry he continued the same old-fashioned service. There was one full time bag boy, who stayed to work after Greg bought the store. All the other bag boys were always high school boys, working after school. If there was no bag boy to bag a customer's groceries and carry them out to their car and put them in the car, then Larry or Greg was the bag boy. You never had to request your groceries to be carried out for you. It was automatically done unless you told them you didn't need them to, and the bag boy took the cart back. Bag boys also stocked the shelves and did all the heavy work. Girls didn't do anything but use the cash registers and bag boys weren't allowed to use the registers, except for Larry or Greg, of course. The magazine and book rack described in this chapter are also real, as is the account of Nettie buying the hard to find Tower Press magazines that day. Mama always got Tower Press magazines when she came up to visit us because she said they were hard to find at home. Tower Press is long since out of business. It was sold to House Of White Birches, but wasn't the same afterwards. I was able to find House Of White Birches on the web, but am not sure if it is the same company. When Tower Press owned the magazines they had a strict policy that nobody could place ads concerning work at home offers (which were almost always a scam back then), making or selling of alcoholic beverages, or anything remotely x-rated. The classified ads were cheap enough to let the housewives place ads to sell their crafts. And most of the magazine was indeed taken up by letters from housewives wanting other housewife pen pals to write to and trade recipes and patterns. I remember there was a small section for letters from children and men, but many of the women stated explicitly in their letters that they would not write to men, only other women. Mama still has some very old copies of the Tower Press magazines in the Time Machine Room as well as the ones that I had articles published in that she has preserved in scrapbooks. I was not able to locate any information on Family Happiness or Happiness as it was later renamed. Probably it is long since gone too. Mama still has some of the very old copies of those magazines carefully preserved in scrapbooks in the Time Machine Room also. Later when I get time to type them up, I plan to republish some of the old articles on my website. They are mostly cooking, recipe, and gardening articles, which don't outdate. That is what I specialized in back then because that was the easiest kind of article to sell to them and for awhile, much to my delight, they were buying everything I sent them, and paying me actual money for it! Walker's IGA has a very nice website but I can't get the link to work, so go to the main IGA website and on their search engine on the home page just type in Burlington, Indiana to get to the listing for Walker's IGA and on that page there is a link to their website. They have many links and also recipes and a blog on their website. There is even a section where you can save their recipes to make a personalized online cookbook on their website. You have to sign up to do this, but it is free, and that also puts you on their e-mail list, so even though I am now too far away to shop there, I did not think it would be wrong to sign up to do this, especially since I'm including this store link for them and someone up home might see this post and go to their store to buy groceries. As far as I could see they only mail out the weekly sale bill as an e-mail now, which does not cost them anything. Back when they used to mail out the actual hard copy sale bill they mailed it first class. I remember it was forwarded to Gain and me the first winter we spent in Florida along with our other first class mail. I felt badly about making them waste a stamp to do that all winter when, of course, I couldn't get in to the store to shop, but had no idea until we got down there that the sale bills would be forwarded. After that I always stopped by the store just before we left to let them know we would be gone all winter and then let them know when we got back to start the mailings again. Here is one more link I found on Walker's IGA website. This link is on their page titled "Better Choices" under a post they have titled "What's In Season?". This link goes to a website called Fruits & Veggies More Matters. It looks to be a very nice website run by an organization that is promoting the use of more fruits and vegetables in people's diets. They have lots of information and recipes to help people do this. I seem to remember they were a nonprofit organization and did not see where they were selling anything. All of their e-mail newsletters you can sign up for are free. It is after 4 o'clock now and I badly need a break. I have been working on this post since almost noon, and am getting tired enough to start erasing everything and having to redo it. So I will take a break and come back later. Just have the rest of the garage wiener roast picnic photos to post as well as writing the diary entry and posting Hammerhead's photos. I will write the diary entry off line so I don't erase it by mistake and it shouldn't take long to finish what I still have left to do. I am not going to have room for all the photos I thought about posting this month, so there is not really much left to do to finish this blog post. So until later this evening. Time to give the cats their supper and then Storybook Hour for me and the Creatures until time to get back to work this evening to finish this. Definitely want to get finished this evening! Have a roast in the Crockpot for my supper so can eat with no more cooking whenever I get hungry. It will be done in another hour and I'll just turn the Crockpot off and it will stay warm until I want supper. I had hoped to get the proofreading done today too, but if I don't get time I will just have to do that tomorrow. I did not get back to finish the August blog post yesterday. I was just too tired, and figured I might accidentally erase something. It is Monday morning now, not ten o'clock yet, and I am sitting here in the Computer Room, also my office, with a cup of coffee and my notebook working on Laptop Computer Boy. I always have the most energy in the morning, so should be able to easily get this post finished and proofread today. 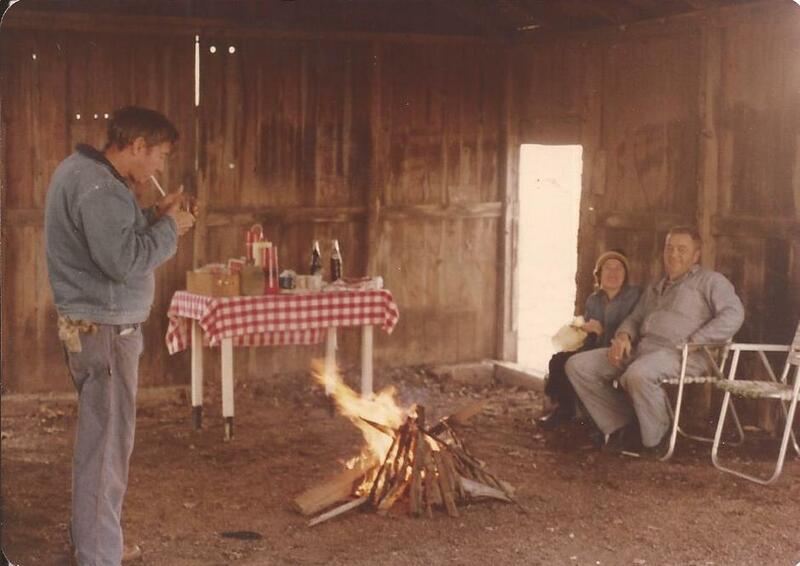 This is one of the photographs Mama took the Easter weekend that we tore the old garage on the Wheeling property down and had a wiener roast inside the garage with the boards we were tearing off. It was April then, Easter weekend, and was very chilly. We were glad of the fire. Daddy is standing up on the left side of the photo. Gain and I are sitting in the chairs on the other side of the garage. This photograph was taken with Daddy's camera by either Gain or me, so I will give Gain credit for the photo. I know it was taken with Daddy's camera, though, because he almost always took black and white photos and developed them himself. This photo shows the garage mostly torn down. The cornfield, not planted yet, of course, is behind them to the east. The outhouse in the background was also torn down, as it wasn't salvageable. Later Gain and I built a new and better one. We were glad to have it when we were outside working so we didn't have to go back inside to use the bathroom, and also when the electricity was off. The electricity was often off in Carroll County due to storms and without electricity we had no water since we had our own pump. We built the new outhouse facing east toward the cornfield for privacy. Hammerhead passed away on the morning of August 3, 2017 Thursday. His visitation was at the Legacy Funeral Center in Jeffersonville, Indiana on Sunday August 6, 2017. The funeral was at the same place on August 7, 2017 Monday. He is buried in Eastern Cemetery in Jeffersonville, Indiana next to his wife Sylvia Hemmerlein. Hammerhead's name is Martin Edward Hemmerlein, but he did not like his first name, so was always known as Hammerhead. He told me that he was called Hammerhead because down in the Ozarks, where he was from, the people were mostly French descent, and for some reason, they could not pronounce Hemmerlein, a German name, so his Daddy was called Hammerhead and Martin became "the little Hammerhead". Hammerhead was my "adopted Daddy", although we were no blood relations. I loved him the same as if he was my Daddy and considered that when I met him that I now had two Daddies, equally beloved. He will be greatly missed. Hammerhead is one of the three people I have ever met that I consider to be righteous, according to the Old Testament meaning of that word. By righteous, I don't mean without faults, but that the person will always try to do the right thing because it is the right thing to do, and can't be bought off at any price or scared off to keep them from doing the right thing. Hammerhead was righteous. The only other two people I have ever known that I would apply that word to are my husband, Gain, and my brother, Charles. Hammerhead was also righteous because he loved the Lord. He did not preach to anyone, and was fond of saying, "I am not a preacher or a teacher, but a provoker. I want to make people think and study the Bible for themselves." He carried a hand made wooden cane shaped like a saw that he had made numerous copies of, each with different Bible verses he had written on them, all from the King James Version of the Bible. He did not approve of the numerous new translations. Although he did not preach to anyone, everyone immediately noticed his cane and commented on it. And that was his opportunity to witness, which he never failed to do, letting them know how much the Lord had done for him. Everyone loved Hammerhead. Like Mama, he never met a stranger. I am just starting to work on the story of Hammerhead's life, writing a little each day in the time we would ordinarily have had together. I had small outings to the various stores and to the restaurants, usually Wendy's, planned for each day except Sunday for him, calling him every morning to tell him that "Van Boy and I are on the way over." Every evening I also called him at 7 o'clock and we would talk on the phone for a half hour. Tuesday was Wilderness Day to see what flowers were currently blooming in my yard and other places. I would have taken him to church on Sunday, but by the time he quit driving and I was doing the driving he said he was unable to sit through the church service anymore, but he read his Bible everyday. The May Pop photographs at the top of this diary entry are for Hammerhead. I was working outside on Sunday July 30, 2017, the day he first got sick. He was unable to talk to me much that day, but when I called him that morning at 10 o'clock as I'd told him I would, I told him about finding the May Pops, three vines of them behind my house. I told him that I was clearing a path so that he could "patrol for flowers" and see the May Pops. 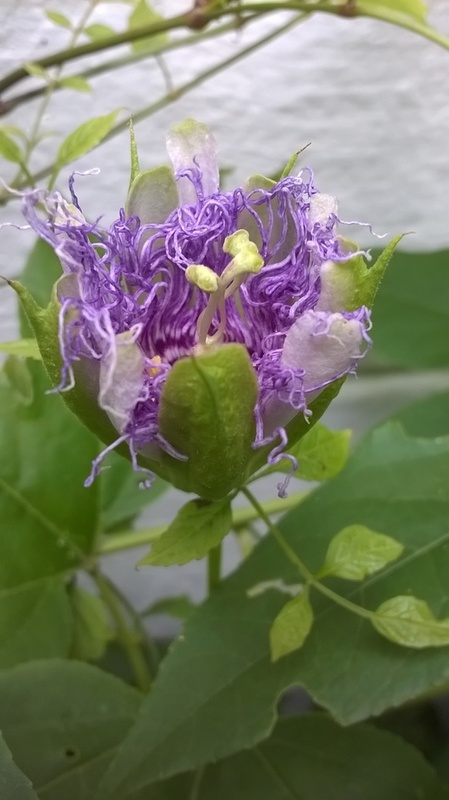 I told him that one of the flowers was blooming, and one had already withered, but that I had taken a photograph and video of the flower still blooming. He said, "I want to see the May Pops." He never got to see them, but the photographs at the top of this diary entry are of more of them blooming on August 11, 2017 Friday. I have not gotten time to try to find out, but the May Pop flowers may be like morning glories, blooming only one day and then fading. I did find out, though, that they bloom from late summer until frost with many flowers, so I check each day to see if there are more. The original May Pop, which Hammerhead spotted last summer on Bell Avenue and that I took a picture of then, is posted on the June 2017 blog. When Hammerhead spotted it on one of our "Wilderness Days", he told me that he had only seen May Pops one other time, 50 years ago, covering a fence around an old factory or warehouse building. I hadn't ever seen a May Pop flower and did not know about them. 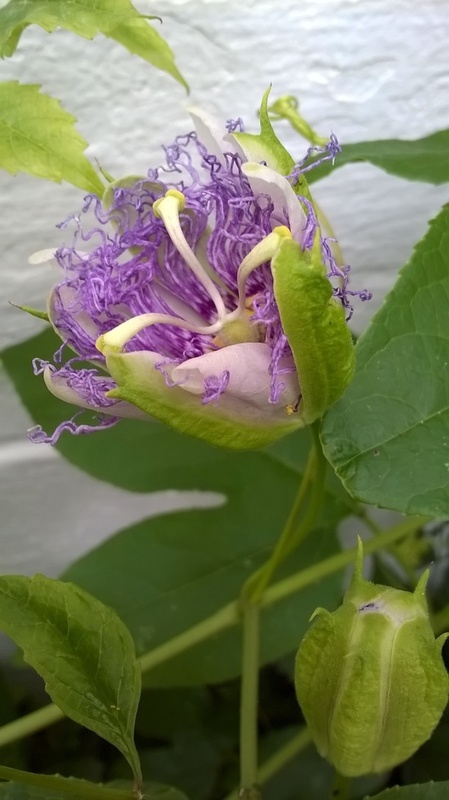 I had seen Passion Flowers, which are the same as the wild May Pops, only bigger. 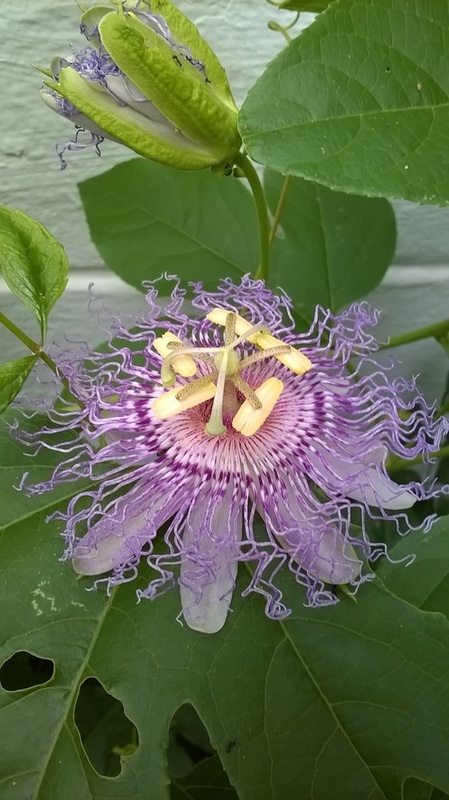 They are called Passion Flowers for the Passion Of Christ, each part supposed to symbolize his crucifixion. We watched the area where the wild May Pops were hoping to see them again this year, but the Weed Man and his evil minions continue mowing them down, not knowing or caring that they are destroying rare and endangered wildflowers as well as the "weeds" they are determined to try to eradicate. The ones on Bell Avenue are still there, but have been mowed down so many times now, they probably will not bloom this year and may not even survive another year. So I was doubly glad to find the three vines of May Pops in my yard when I was carefully clearing out only enough for a walking path to "patrol for flowers", but destroying nothing that I didn't have to, and then only cutting it down, not actually pulling any plants up. Possibly the May Pops had been there for many years before in my yard, but I might have been destroying them myself each year, when the Weed Man harassed me and so I cut everything down he might possibly consider a forbidden weed, not even knowing what plants I was destroying. That has ended this year, though. There will be more about this later when I have room in the diary for more Lost Eden news, but essentially everything has died down with the Weed Man. I think he found out that he couldn't do anything after all, and certainly not put me in jail for "excess vegetation" like he wanted to, but probably I can't do anything either because essentially nobody cares. I heard from the News And Tribune this month, but they can't do the article because it would only be opinion and not facts, which I understand completely. After all newspapers are only supposed to publish facts, not opinions. So I have about decided to just let well enough alone since the Weed Man is not harassing me anymore, concentrate on doing what little I can to preserve the plants and environment in my yard, and continue my research in case an opportunity to help in some way comes up. But I realize there is little beyond that I can really do about global warming since nobody even cares what is happening apparently. I'm sure some people do, but not enough for us to make a difference. So that is the update on that. I will keep you posted as I continue my research. Finally, before closing out this blog entry, here is what is coming up in Mariette's Nightmare House book next month. Next month's chapter will be "Nightmare Four: Mariette's Nightmare: Lost In The NIghtmare City Without A Name". This will only be a short chapter, one of the nightmare chapters. The archetypal city that Mariette dreams about is New Albany, Indiana, as I remember it from when I was a little girl. In her story the city is called Old Albany, but it looks just the same as the old New Albany I remember. I still need to look up photographs to illustrate that chapter. Mama has numerous very old black and white photographs of various family members taken in New Albany and I will use some of them next month. She also has books of photographs of old buildings that she and Daddy took at various times. 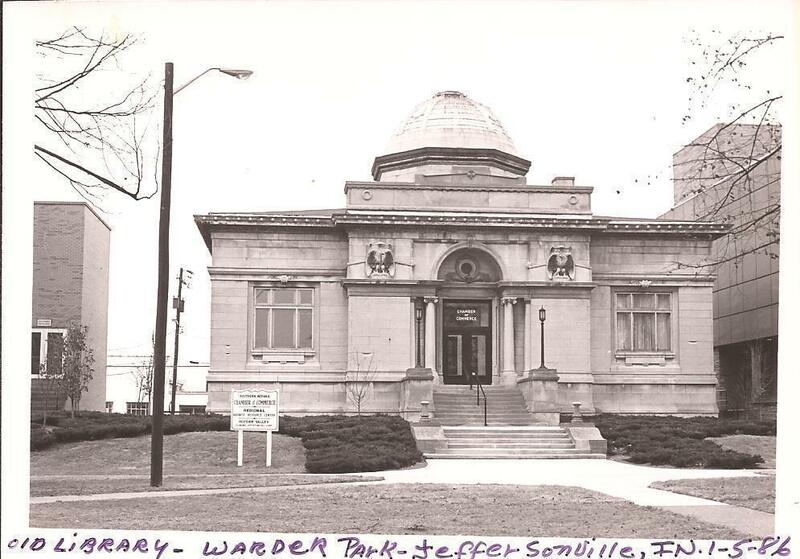 I think there is one whole book of buildings in New Albany, some no longer in existence. She and Daddy took many photographs at various times, but she also told me that whenever they heard about a building that was going to be torn down, they went and quickly got photographs of it. So I may have the only photographs of some of these buildings. I was going to have more about what is coming up, but only have enough room left this post to post one more photograph of Hammerhead, so will write more about what is coming up next for Mariette's book next month.